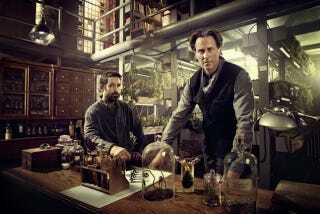 Chances are you've never watched Syfy's mad science show Helix. It airs on Friday nights, it doesn't get a lot of buzz, and if you've ever caught a promo, it must look pretty confusing. And it is! But it's also completely insane, and that's what makes it one of the most fascinating, entertaining shows on right now. To be fair, if you have seen Helix, you've probably given up on it, because you were completely frustrated at its inability to ever solve any of its mysteries. In fact, if you made it through the first season, you were very likely disappointed at the show's complete refusal to answer a single one of the major plot threads. I understand that, and if you're on the fence about Helix, I imagine this sounds pretty damning. But I'm here to tell you the show is worth watching anyway. "Okay, so this guy is crazy. The woman that's clearly his age is his daughter, and he's tied her up because she joined an evil company he once worked for to make a killer virus. The other two people in the room are his wife and adopted son, but they don't really exist except in the guy's head because they're dead. Also it's 30 years in the future. Also they're immortal." This is the simplest summary I could give her, and it is clearly ridiculous. But because the show is full of so much WTFuckery that this is true of pretty much any moment in the series. I can tell you the overall plot includes multiple shadowy groups trying to make incredible deadly and gross viruses for unknown reasons, and that there's an evil corporation run by 500 immortals, and the protagonist has gone on a murder spree and joined a mysterious cult, but does that really do you any good? I assure you it does not. Because Helix has no answers. At all. I don't think it has any idea what its doing, where its going, what its endgame is, or why it does much of anything on an episode-to-episode basis. Instead of giving answers, Helix introduces about five new mysteries in ever episode — mysteries that range from "Why is this main character secretly hiding among these cultists?" to "Why are there hundreds of frozen monkeys covering the landscape?" — and Helix can be relied on to answer… maybe one of them. That's it. In fact, of all the huge plot threads the show brought up in season one, I think all of them were not resolved in the slightest. So unresolved, in fact, that three episodes in to season 2 and we have only the vaguest clue as to what happened to one of the characters during the year-long interval between the finale and the season 2 premiere, and that's that she's been pregnant for 15 months." Admittedly, if you want a coherent, planned out story, Helix is not for you. And if you want a show with a rich mythology that it slowly reveals over time, well, you might hate Helix more than any show in the world. I used to be worried about the answers too, and then they cut off Jeri Ryan's head and stuck it in a jar. Then the bad guys drugged a bunch of kids with some kind of tea, and they lured a character away and beat him half-to-death with rocks. Then… well, you get the picture. What Helix lacks in coherence it has gained in including at least three jaw-dropping, batshit insane moments every episode, and if you can make peace with the fact that none of the show is ever going to make sense, Helix is a sublime experience. It's a lot like Lost, and I'm not just saying that because Helix's second season is set on a mysterious island inhabited by a bizarre group with mysterious motives (Helix season 2 is also basically a remake of season one, which is pretty crazy unto itself, but that's neither here nor there). Obviously, many people were very upset when the Lost finale when it failed to deliver the answers to all they'd been hoping for. But does the ending really negate all the entertainment value Lost provided on a weekly basis before then? Does the final episode erase all the joy out of the craziness of seeing the smoke monster for the first time? Or the four-toed statue? Or realizing we were watching a flash-forward? It didn't for me, and it doesn't for Helix. In fact, I'm pretty confident that if Helix has answers to its crazy virus/apocalypse/immortal/evil corporation nonsense — or it thinks it has answers — they're going to be terrible, and frankly, I'd rather just not get them. This show is too damn ridiculous to ever be properly explained, but that is exactly what makes it so massively entertaining. In fact, Helix is the most purely entertaining show on Syfy, and one of the greatest, most enjoyable shows currently airing. Maybe it's not one of the "best" shows currently airing, but it's definitely one of the most creative and imaginative, and that should count for something, dammit. It's certainly not for everyone, but those who can accept the show will never make sense and move past it will discover a uniquely fulfilling TV experience. Unless you know of another show where the main characters can wander into a field of hundreds of skulls and it's only like the third weirdest thing that's happened to them that day.